Ask fellow campers about "Blanton Creek Park" and nearby attractions. We stayed 3 days. The park is right beside the lake. About 1/2 the sites are lakeside and the other 1/2 have lake view. All sites are level with crushed gravel pads and great hookups. 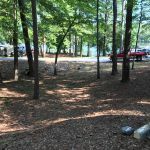 It's one of the cleanest campgrounds I've seen and the staff was extremely helpful. We camped at Blanton Creek Park in a Fifth Wheel. Columbus Georgia is amazing! Civil War Maritime Museum, Infantry Museum -both amazing. 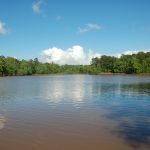 The Riverfront has wonderful hiking and a zip line across the river. You can rent rafts, kayaks and more. Broadway street downtown has some really cool restaurants and shops. Then of course you're also within driving range of Wild Animal Safari, Little White House, FDR State Park, and Callaway Gardens. SO much to do near the park. We stay at this campground four or five times a year and love it. The host(s) are always very helpful and friendly. The facilities are always clean and in good order. The pads are always clean. This is our favorite place to camp. We camped at Blanton Creek Park in a Travel Trailer. We love this park. The park is in Central time and the office is on Eastern time, so have to pay attention when the gate is locked. We stayed by the lake but there are other sites that are good too. There's fishing and water activities and a small playground for the kids. It's well worth the trip to stay. Be sure you have groceries--it's a few miles to get to nearest food source. We camped at Blanton Creek Park in a Fifth Wheel. This park is within 30 minutes from our home, and this was our first camping trip there. We came in on Thursday afternoon and there were only 6 other campers there. Our site was a fairly isolated, very shady spot. We did not stay directly on the water, but had a great view all the same. This campground is great if you are not looking for lots to do. Fishing and boating are the main attractions here. There was a small playground though the woods but otherwise, nothing else for kids to do. The hosts were very nice and helpful. We attend church nearby, and were not sure if we would make the 1:00 checkout time. We checked with the camp hosts on Sunday morning and found that our site was not reserved for that day, so we were allowed to take our time leaving. Also, we visited the campground ahead of time and rode through to find the sites we liked before making reservations. One other thing to note is that they are not set up to take credit cards, but will take personal checks as well as cash. Even though we left past the checkout time, we sat in line at the dump station for at least 30 minutes. We enjoyed our trip, and would come again for a quick weekend. We camped at Blanton Creek Park in a Travel Trailer. This is a great park for relaxation. We have stayed here twice, a week in August 2004 and 2 weeks in July 2005, while my wife worked in nearby Columbus. The sites are mostly level. There are only a couple of pull-thrus. Some of the sites are a challenge to back into, especially if located on a hill. The sites on the water are fabulous with great views. You can fish right from your site. There is a boat ramp and then you can tie your boat up at your site. The sites away from the water are also nice. All sites are large, with tables and fire rings. All are shady. You are allowed to drain grey-water at most sites. A dump station is available. Most of the waterfront sites are taken on the weekends, but during the week there is often only 1-2 campers. The tent area is located on a point jutting out into the lake. These 8 campsites share a common parking area. Each has electricity, but water is at a central location. These sites are very popular. The restrooms are modern and clean. There are laundry facilities available. The hosts are very friendly. Boating and fishing are the most common activities besides relaxing. A lot of families camp here. The only playground is in a nearby day-use area. There's not much at the camp "store" besides ice. Nearest country store is about 2 miles, but most campers go to one farther away. This is a great place to spend a relaxing few days. The scenery is great, the sites are comfortable and the price is right. We camped at Blanton Creek Park in a Travel Trailer. In the middle of nowhere or I would rate it better. Good fishing lake. We camped at Blanton Creek Park in a Motorhome. 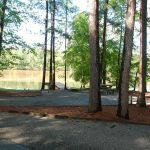 This campground is a part of the Georgia Power Receration areas. All of the sites were well shaded and were not set up on top of each other. 10 - 12 sites were lake front on Lake Harding. We stopped here on a trip to Florida. Sites were level and appeared to be recently updated or just built. Plenty of space to ride a bike or walk. Major reasons for lower score was the lack of items for kids to due, the playground was not near the campsites, and no sewer at site. The dumpstation was easy to pull in too. The campground hosts were friendly and located on site. We camped at Blanton Creek Park in a Travel Trailer. Are you affiliated with Blanton Creek Park ?